Considering the price, design, durability, comfort and efficiency of these gloves, they're a great way for new boxers to get started with some great gloves without breaking the bank. These gloves last long, hit hard, absorb most shock and are light as a feather. The amount of support given to the hand and fingers is surprisingly good considering that these gloves cost only around $50.00. 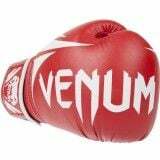 With the low price-point and unmatched quality offered by Venum, you can't go wrong with the Venum Challenger 2.0 Boxing Gloves. Venum is a brand known to every professional MMA fighter, as they sponsor some of the best MMA-competitors such as Mauricio Rua, Lyoto Machida and Jose Aldo. 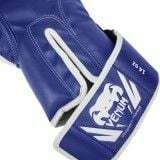 Venum also has a strong background as an MMA equipment supplier, making no sacrifices in weight, durability, comfort or style. 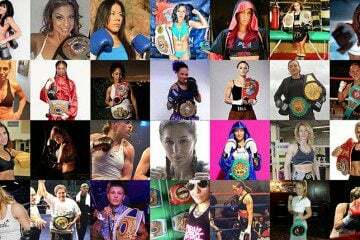 The professional level products supplied by Venum speak for themselves in real-life applications, as many trainers and fighters heavily endorse Venum and what they stand for. Their uncompromising dedication to making superior MMA equipment is reflected in Venum Challenger 2.0 Boxing Gloves (EST. 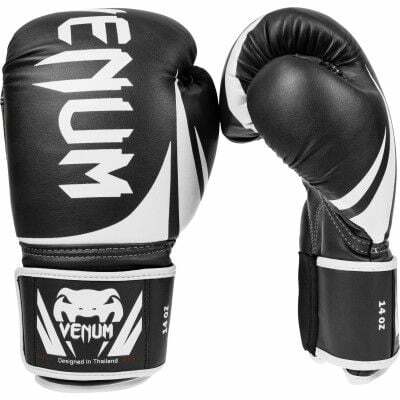 $50 on Amazon), which are a great way for new boxers or those on a budget to learn what it means to fight and train with Venum gloves. The Polyurethane leather surface on the Challenger 2.0 gloves make them smooth and slick, and also results in more powerful impacts due to the plastic in the hybrid-leather. The smooth surface is also easy to clean and not susceptible to liquid damage. The gloves themselves vary in length and size depending on weight, but still protect your wrists as well as entry-level professional gloves should, no matter the size. The interior foam is triple-layered, meaning your hands get the ultimate shock-absorbing protection and are also less likely to be sprained. The wrist enclosure is built with a combination of elastic and Velcro, allowing you to fit the gloves tightly on your hands regardless of your individual wrist and hand size. The mesh in the palm area allows some ventilation to help keep your hands dry, allowing you to train and fight for longer without having to dry off. 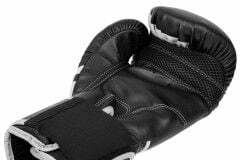 Off the bat, these gloves look and feel fantastic, giving the appearance of high-grade pro-MMA boxing gloves. 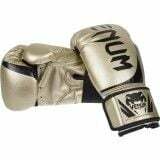 Available in red, blue, black and gold, the Venum Challenger 2.0 Boxing Gloves are designed with the signature Venum logo on the wrist guard, along with the company insignia. The fist-section also has a bold and confident “Venum” text that wraps around the whole of the gloves’ front, along with some sharp stylistic lines that give the Challengers a very intimidating appearance. The design is breathable and comfortable, regardless of whether you buy the 10, 12, 14 or 16 ounce versions of the Challenger 2.0’s. The real advantage comes from the price you’ll pay for Venum Challenger 2.0 Boxing Gloves, are they’re priced as beginner level boxing gloves. But don’t let the price fool you, these gloves offer the closest performance to the real-deal that you’re likely to get out of lower-budget gloves. Barely priced around US$50.00, these gloves cost half of what you would pay for the more expensive “Hayabusa” gloves, and still compare very well to them, offering competitive performance and durability.